Akbar Brothers Group won five awards at the Presidential Export Awards Ceremony conducted by the Export Development Board at the BMICH last week. It was presided over by President Maithripala Sirisena. 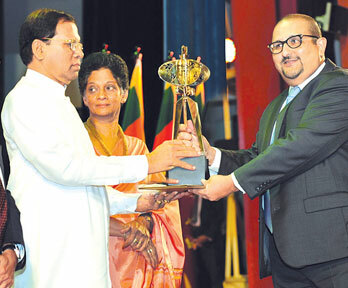 The awards were presented to recognize the outstanding contributions by exporters to the economy of Sri Lanka in 2014 and 2015. Akbar Brothers Group won three overall awards covering all export sectors, Best Sri Lanka Brand Exporter for 2014 and 2015. Akbar Brothers Group was also adjudged as the Most Market Diversified Exporter among all exporters in 2015. In the Tea sector, Akbar Brothers won awards for the Highest Foreign Exchange Earner in respect of 2014 and 2015. Chairman, Akbar Brothers Group of Companies, Abbas Akbarally said Government policy accords high priority for foreign exchange earnings and for branding of Sri Lanka products in the world market. “We are indeed happy that our contribution towards these development efforts has been recognized by the Government,” he said. “The greatest strength of Sri Lanka tea industry is the unique image of Pure Ceylon Tea. As the largest exporter of Pure Ceylon Teas in the international market for over 25 years, we will continue to promote the image of Ceylon Tea in order to maxim ize the returns to all the Stakeholders of the Tea Industry,” Akbarally said.